Windows are an everyday part of life. There is no home or building across Canada that does not have windows. Could you imagine if there were? Rooms would be dark or lit up with artificial or florescent lighting. Windows bring light, views and warmth to the interior of your space, so keeping them in good shape is very important. 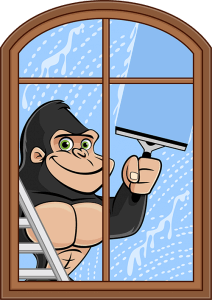 When you want to keep your windows shining, call a Gorilla for your Sylvan Lake window cleaning. What Do Dirty Windows Mean For You? The glass around your property is hard to the touch but that does not stop unwelcome material from sneaking inside. Glass is porous, meaning that sitting dust, dirt or other debris can sink into the pores across glass. This means that with each passing day that your windows are left to the elements, they are wearing away at the integrity of your glass. Instead of waiting for unnecessary damage to occur, get the jump on maintenance with a Sylvan Lake window cleaning. When you want the best results for your Sylvan Lake window cleaning, there is more to it than reaching for a standard blue cleaner. Over the years, our Gorillas have perfected their window cleaning techniques. Instead of simply using paper towels and standard cleaners, our Gorillas use rubber tools to eliminate static cling. By using squeegees, our Gorillas can ensure a proper clean along seams and in corners. This is all well and good when windows are within reach but what about those higher ones? By using Tucker Poles and a mobile water source attached to our Gorilla-Mobiles, are services are able to reach windows up to four storeys. When you choose a Gorilla for your Sylvan Lake window cleaning, you are getting a well-rounded service. We don’t simply ignore dirty sills or frames, but we get them clean as well.